These Candied Yams glazed with white and brown sugar and pumpkin pie spice will be the talk of your Sunday Dinner table. We had Sunday Dinner for the family this weekend and we enjoyed Turkey Ribs from Pop ‘n Smoked BBQ, a local restaurant. Now who has ever heard of turkey ribs???? It’s all a mystery to me as to how they cut the turkey breast to make these darlings but are they ever good to me!!!! We also grubbed on Southern Style Mac and Cheese, Auntee Gail’s Turnip Greens, Hot Water Cornbread and this Southern Candied Yams Recipe. 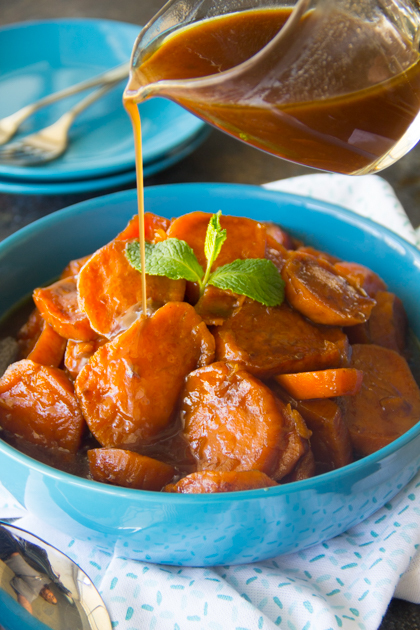 Do you know how t fix candied yams? It took me forever to learn how to fix candied yams because I wanted to perfect the recipe. See candied yams are best when you have the right ratio of butter to sugar and you allow them to cook for at least an hour to make sure they are nice, tender and caramelized!!! 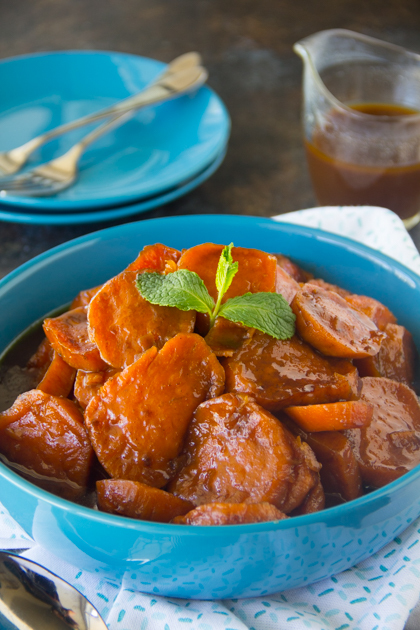 Now that I know how to fix candied yams, I make this very special comfort dish all the time. I hope you’ll try it soon! 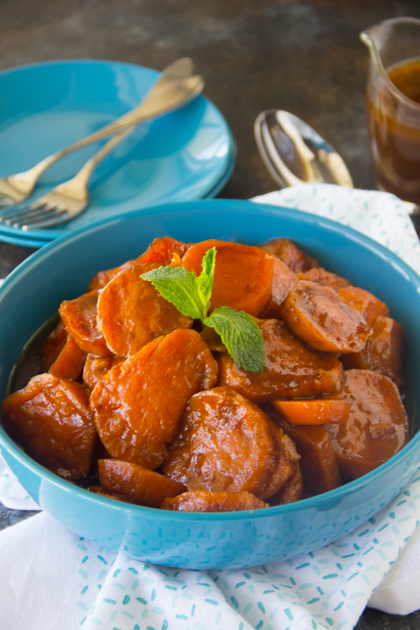 Place sliced yams into a 10x13 baking dish. Using a small saucepan, melt butter over medium heat. Add all three sugars and pumpkin spice. Mix to combine. Remove from heat and add vanilla, lemon, and coconut. Pour mixture all over sliced yams to coat. Cover with foil and roast for 60-70 minutes or until tender. Remove from the oven and baste with mixture. Place yams back into oven and roast for another 20 minutes uncovered. 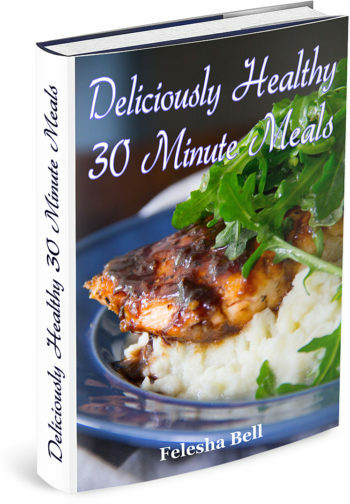 Remove from the oven and allow to sit for about 10 minutes before serving. Say Grace and enjoy!! I don’t think I’ve ever had yams buy these sound really delicious! I would definitely like to try them one day. Really?!!?! You will not be disappointed, Corina!! 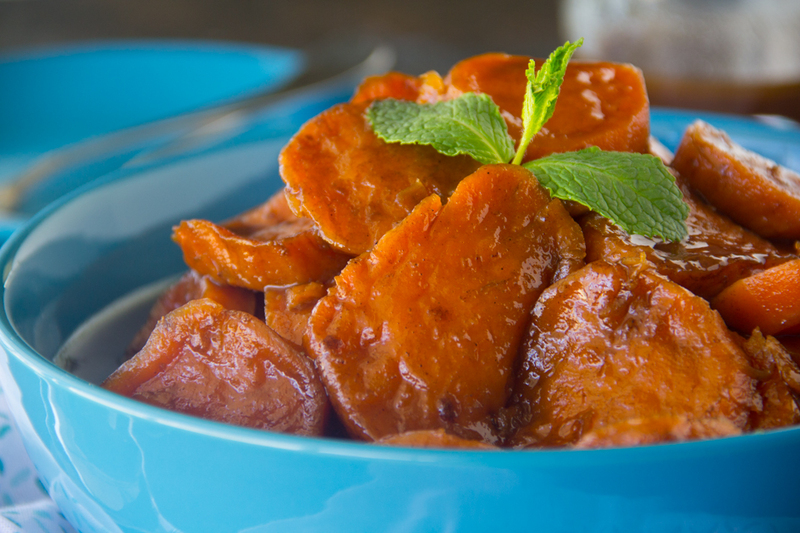 these candied yams look delicious! Thanks for going through all the recipe perfecting so I don’t have to! These look so delicious! And it’s making me wonder why I’ve never made candied yams before. Gotta put these on my must make list for Thanksgiving! I’ve never had anything like this before it sounds so yummy! Ok so I have never made these type of yams before because mainly I thought it was a long process but I will try his recipe since it looks so simple! Thanks! Candied yams are a great delicacy here in my house. My sister usually makes them for holidays and I have yet to try to make them since she does it so well! But, now I have your recipe so I can make candied yam whenever I feel like it and not rely on my sister! Yay! Haha!!! Yes! I hear a fun competition in the making, Elaine!!! Lol!